Jabra Elite 25e. Best-in-class battery for wireless calls and music, with up to 18 hours of use. Wind and water resistant for durability on the move. Access Siri and Google Now with just one touch. 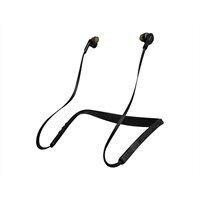 Jabra elite 25e - Earphones with mic - in-ear Behind-the-Neck Mount - Bluetooth - WirelessJabra Elite 25e. Best-in-class battery for wireless calls and music, with up to 18 hours of use. Wind and water resistant for durability on the move. Access Siri and Google Now with just one touch. Jabra Elite 25e takes your calls and plays your music throughout the day, wherever that may take you. With an unrivalled 18 hours battery time, Elite 25e gives you the freedom to stay connected. With a wind-protected microphone and weather-resistant durability, the Jabra Elite 25e delivers outstanding call quality in all weather – allowing you to ignore the elements, but not the conversations you need to take part in. By developing our neckband design, Jabra Elite 25e now provides added comfort for all-day use. And by enhancing the fit with our EarGels, you also gain better sound for calls and music. Optimize your time at the touch of a button. Jabra Elite 25e features a voice button that instantly connects you to Siri or Google Now , allowing you to quickly get the information you need. With 10mm speakers engineered for immersive audio, Jabra Elite 25e delivers full-spectrum music quality. Whether you prefer rich bass or crisp high tones, your sound quality needs won't be compromised.